You could hear a pin drop when he speaks, despite how many people are in the room. He has a mesmerizing presence, one I have seen before but one that is unfamiliar to the Intrepid Junior Blogger who stands transfixed behind him. She has somehow managed to find herself front and centre on the stage, her red hair rapidly fading to salmon pink but brightened by the red and black lace dress and red boots. I can see it on her face. She is completely enthralled. He, of course, is Justin Trudeau, and we are at MacDonald Island Park where he is speaking to a crowd gathered to greet him and local Liberal candidate for the Fort McMurray-Athabasca by-election Kyle Harrietha. Even before he arrives there is a buzz in the room, a building energy. The crowd has come to see the leader of the federal Liberals, and to hear him speak. Some have seen him before. For many, like the IJB and I, this will be the first time to see him in person. And when he enters there it is, the presence and charisma for which his father was known. I remember it well from my days as a child and watching Pierre Elliott Trudeau sweep onto a stage. He was controversial in many regards, as politicians always are, but no one could deny his presence or his intellect. Intellect is what always mattered when we discussed politics when I was growing up. My father, who was deeply interested in the political world, thought staunch allegiance to any one party was foolish, and he advocated voting and supporting depending on the time, the issues and the people in the party. And like my father I have, over the course of my life, voted for candidates from every of the three major federal parties as I felt appropriate for the time and circumstances. 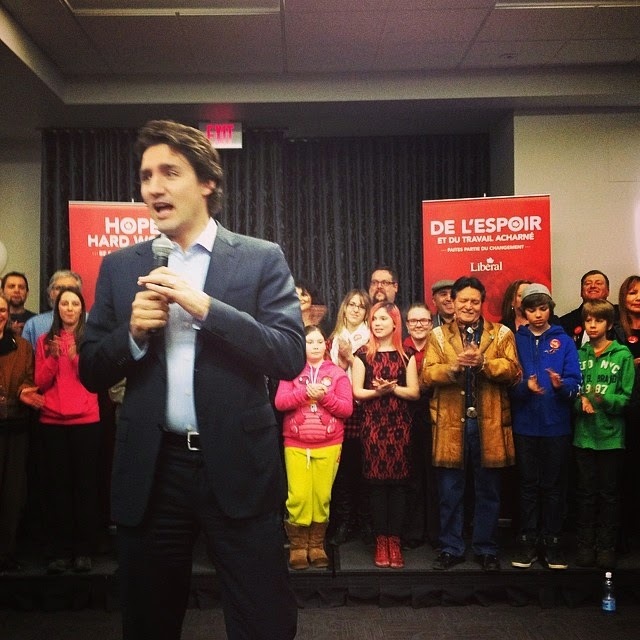 Justin Trudeau carries the legacy of his father, and all that entails, both good and bad. But just as my daughter is her own person separate from her mother so too is Justin, and so too he should be evaluated on his own merits as opposed to those of his famous father. This is one of those lessons my father taught me, to judge each and every person as individuals, and one of the lessons I am proud to teach my daughter. 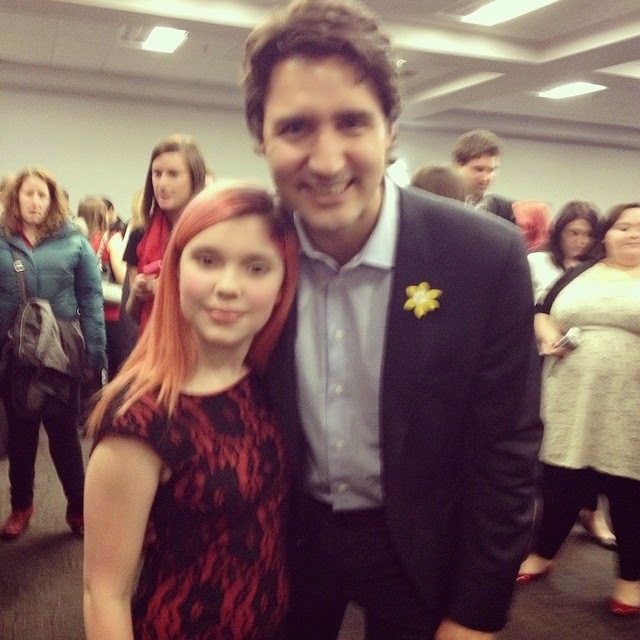 Last night I went on Twitter to share a photo of my daughter at the event and to comment that Justin is a powerful speaker, much like his father. I was stunned by the reaction, because almost immediately I was set upon by his detractors, much like rabid dogs in their attack. One comment in particular enraged me, stating that Trudeau's support from young women proved the "shallowness" of the Liberal party. The condescension in that comment - that my child, because she is young and female, could not possibly form an intelligent or informed opinion on a political party or leader - outraged me. The ageism, the sexism, the sheer audacity to imply that she was incapable of independent thought angered me to the boiling point - because it is youth like my child who will one day lead this country, and my child is quite likely more informed about politics than some adults in our nation. One can often tell your impact from the amount of defense you generate. No one feels the need to respond to an opponent who has no power, no impact and no influence. But when they feel the need to rise to attack (and attack not only the politician but those who are impressed by him, including young women) you know they are feeling threatened. And so perhaps they should be. Justin Trudeau brings new life to a party that was on the precipice of disaster not so long ago. Say what you like about his ideology and politics, but one cannot deny his charm, his charisma or his presence - and one should never, never underestimate their value in politics, either. My daughter, who at fourteen is passionate about science and politics and the world and in making a difference, believes in hope and hard work. Last night after we left the event she stopped at one of the pianos at MacDonald Island and played a bit, and as she played we chatted about what Trudeau had said. We talked about the message that Canada as a country is strong not in spite of our differences but because of them. We talked about a message of this country being an incredible place of diversity with room for all opinions and thoughts (despite those who would claim young women are not entitled to those). We talked about the future. And then we packed up and headed home, a mother and daughter who have both been impacted by someone with a famous last name. To see her watch Justin reminded me so much of my youth spent watching transfixed as his father spoke. I recognized the look on her face, the wonder and the inspiration. I knew that this would be a pivotal experience in the journey of one young woman, because once, a long time ago, it was in my own. My daughter and I share so many things, as I learned when I reconnected this week with someone I have not seen in almost thirty years and who commented when seeing a photo of my daughter that she looked so much like me three decades ago. So too do we share the legacy of a famous Canadian family, a father and son. A mother and a daughter, a father and a son - sometimes life is a circle, and last night it circled around once more for my daughter and I as we shared yet another moment in our lives in Fort McMurray.